Here’s my video review of Xiaomi 360 Mijia as 360° video. This video is best viewed within YouTube app. When watching it on your computer make sure the browser supports 360° videos (e.g. Chrome). 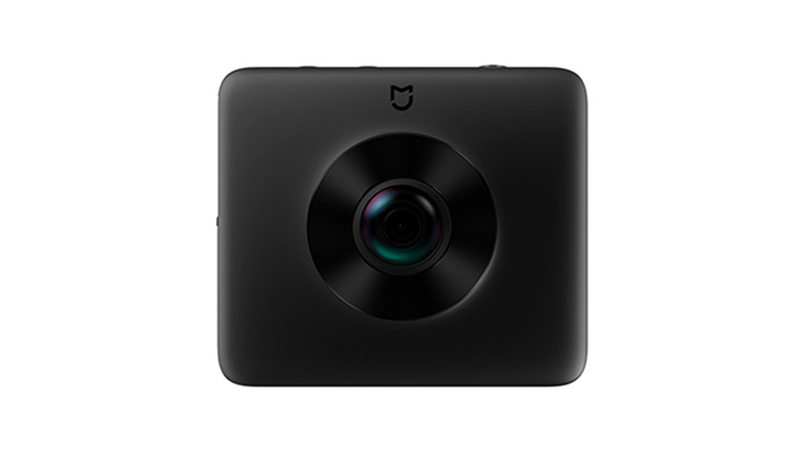 This camera is distributed by Xiaomi Company and manufactured by MadVenture360. 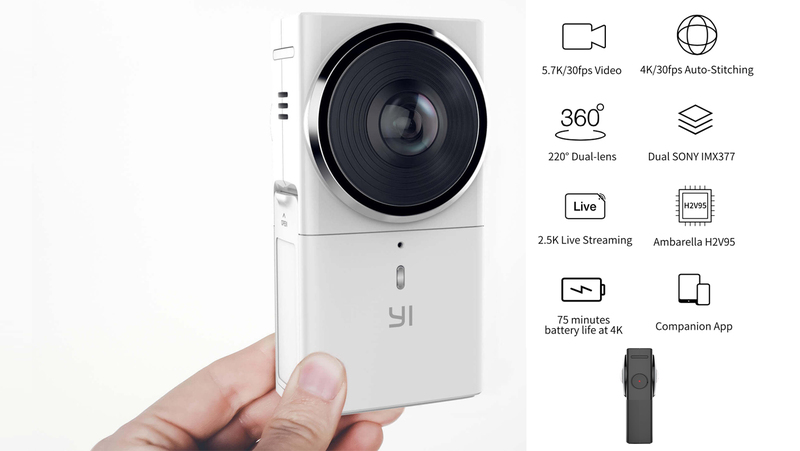 It is not affiliated with YI Technology (“Xiaomi Yi”), manufacturer of the YI Action Camera and YI 360 VR. 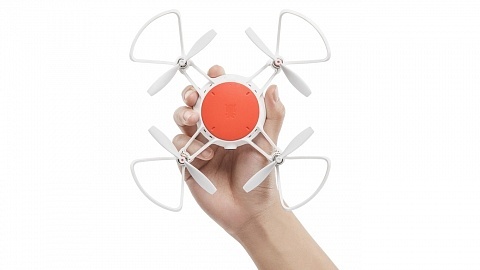 It is also not affiliated with Xiaomi Mijia Action Camera, which is manufactured by FIMI, who are also producing the Xiaomi Mi Drone. 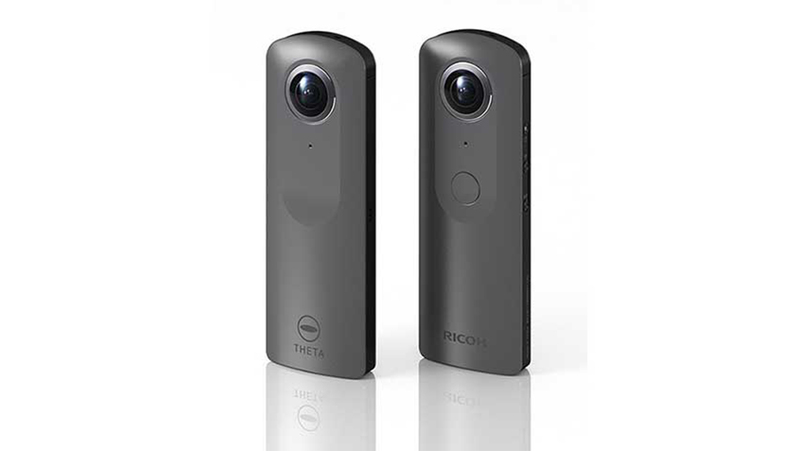 Panoramic cameras recently became a trend, especially after Facebook and YouTube introduced 360° video upload. That way you can play a video on your smartphone and look around within the video by turning your device. As for YouTube this only works if you play the video within the YouTube App or on your computer with Google Chrome browser. 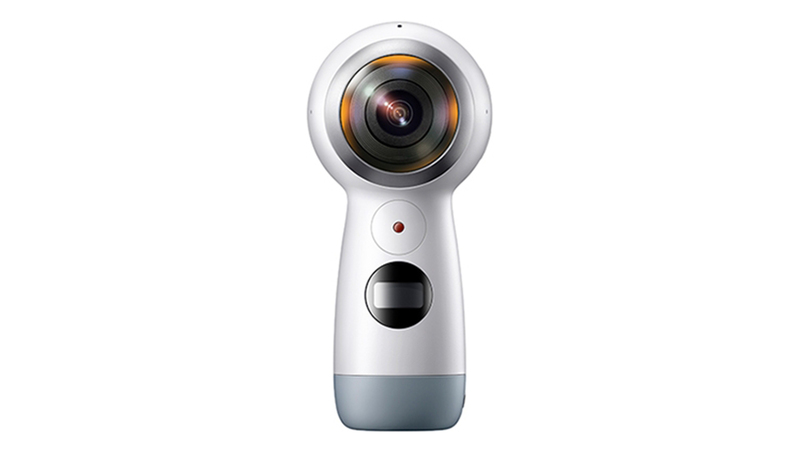 Other famous brands already released 360° cameras, such as Samsung’s Gear 360, Inst360 One and the most famous: GoPro Fusion. 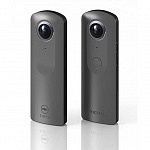 The cheapest camera to offer 2 lenses is MGCOOL / Elephone Cam360. Be aware there are other cameras named “panoramic camera” which feature just one lens, but you won’t get a full 360° video or picture! 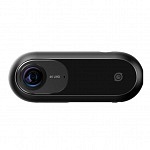 Xiaomi 360° camera uses a Sony IMX 206 sensor, that’s the same sensor being used in YI Action Camera. I think there are two sensors being used in the camera as this sensor is not capable of 4K video resolution. 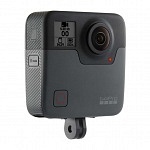 The camera features an Ambarella A12 processor, same sensor being used in SJCAM SJ7 Star or Thieye T5 action camera. 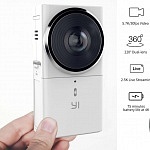 Xiaomi Mijia features 2 lenses on each side of the camera, each of them having 190° FOV, consisting of 5 glass layers with an aperture of 2.0 and focal length of 1,43. Live Preview is available in 1440 x 720 at 30fps. The resolutions are in 2:1 format which is required for a full panoramic video. As the height of 4K video (actually UHD) is 2160 pixels and HD is 1080 pixels, the resolution of this camera is between these. If referred to width of the video, you could call it 3.5K camera. videos are recorded in .h264 codec. Mijia is equipped with stabilisation, which seems to be turn on all the time (no setting for that). Max. photo resolution is 6912 x 3456 pixels (3456 x 1728 is also available) in .jpg format. Mijia doesn’t offer a display. You can switch photo / video mode with the button on top. All other settings are done via app. 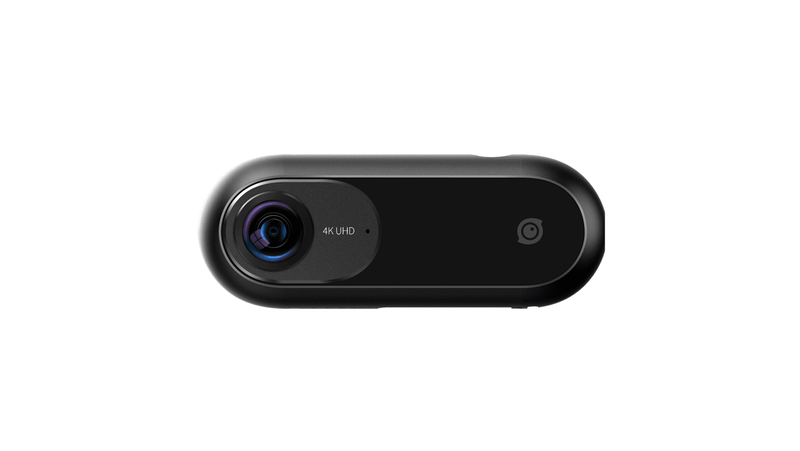 Xiami 360° cam holds a built-in 1600 mAh battery which lasts for 75 min of video recording. microSD cards class U3 are required, max. 128 GB cards are supported. Xiaomi Mijia connects to via WiFi and Bluetooth; an App “Mi Spheric Camera”is available for iOS and Android. The only port the the cam is a micro USB port. On the bottom of the camera is a 1/4″ standard tripod thread for mounting. Included is a small tripod as well as USB cable. Basically both cameras are identical from their specs. The only difference is visible: MadVenture 360 is orange. There are 2 Apps available and MadVenture stated that they will put more effort in developing their app. Therefore the 4K resolution option was made available on their app first. I’m not quite sure which side is the front and which the back side. Let’s put it this way: On one side there is a logo visible (left photo). When you turn on the camera on the other side some LEDs will light up (right photo). On the photo you can hardly see the LED’s. The sun was shining straight on the camera, but they are still very good visible. Above the lens are a photo camera and video camera symbol to indicate operation mode. During startup (shown in the photo) both light up). Right of the lens is a battery symbol indicating its status. On top of Xiaomi 360° Mijia You will find 3 buttons: Record/Shutter, Power/Mode Switch and wifi button. When you long press the power button you can turn the camera on and off. When you short press it, you can switch between photo and video mode. Microphone holes are on the outer end. 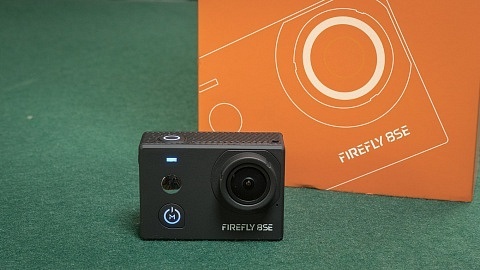 One side of the camera holds a flap that covers microUSB port and micro SD card slot. A 1/4″ standard photo tripod thread is on the bottom. Next to it are charging contacts, maybe for other accessories or a charging station. There is no display, therefore you need to download the App to change the settings. Without App you can only switch between photo and video mode. Scan the QR code in the manual which will get you to Google Play Store or Apple App Store and download the App: “Mi Sphere Camera”. Press the wifi button on the top of the camera. Press the button on the bottom of the app “connect to camera”. Your phone will search for the wifi. Standard password is: 12345678. On your iPhone you might have to go to the settings and select wifi there. When using the app you can edit the settings of Xiaomi 360. During the Live-Preview you can also turn your phone to look around. You can either choose 3456 x 1728 at 30fps or 2304 x 1152 at 60 or 30fps. The format is 2:1.
can be set to Auto or adjusted manually with the options: Outdoors, Cloudy, Incandescent or Fluorescent to correct the color of your image. with a slider you can adjust exposure +/- 3 EV in 0.5 units. often called loop recording creates shorter files and overwrites the oldest ones once the micro SD card is full. You can either set 6912 x 3456 (23MP) or 3456 x 1728 pixel photo resolution. In contrast to video settings ISO can be set for photos: Auto, 50, 100, 200, 400, 800, 1600. 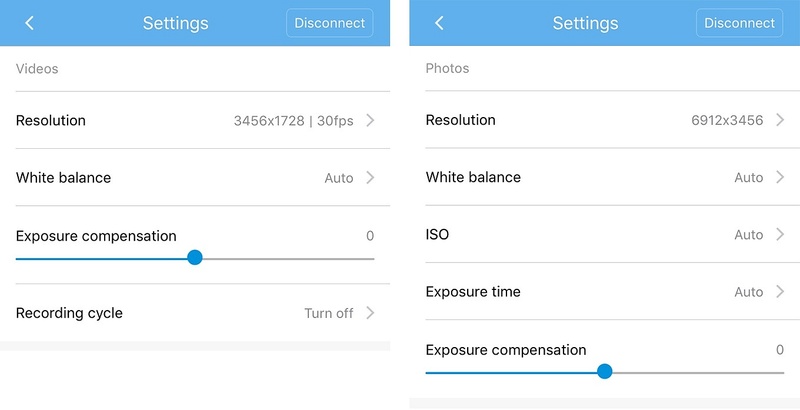 You can set exposure time (Auto, 1S, 2S, 4S, 8S) for long exposure photos. Similar to video mode +/-3 EV. You can set wifi name & password. You can choose between Mirror ball, Flat, Little Planet & Pano for the live preview on your phone. You can with it off or let the cam turn off after 5 or 10 min in standby. If the LEDs are disturbing or reflecting it is nice to have the option to turn them off. 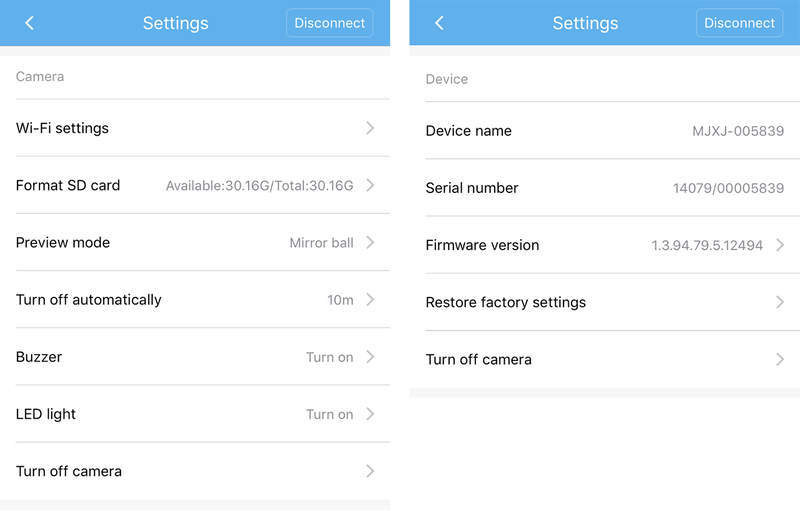 Here you can find all infos about your camera: Name (= standard wifi), Serial Number & Firmware version. When you press it you can check for updates, but the app notifies you automatically if they are available. 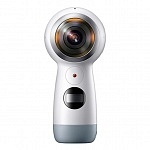 Xiaomi 360 Mijia itself records a dual spherical video – that’s a video containing two images next to each other. You need to convert this type of video into a equirectangular video. 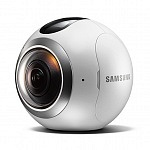 You’ve got several options to convert from Double Spherical Video to Equirectangular Video. You can convert your video using Mi Sphere App (iOS and Android). A PC software was released in August 2017, Mac software will follow – stay tuned. You could go for a 3rd party stichting software, but I haven’t found any free software tools. Free software for other cameras don’t match the settings of Xiaomi Mijia and stitching doesn’t look good. There is of course professional software, but they are very expensive. Note: with the latest iOS Update (1.8.0) you can render 3456 × 1728 videos with iPhone 6S or later. It was limited to 2304 × 1152 with earlier App versions. Go to the library within Mi Sphere App. (On top there is a selection camera & local library). Open a clip on your camera and click download on the bottom. The video is now downloded to your phone and locally saved. But this is just the first step, you need to export the clip to stitch the video. On the top right of the screen is a share icon. Press it and you will find several share options including YouTube. Hence I discovered a problem: With the latest iOS App version it is possible to render full resolution videos. But when you click on share and YouTube, only a 2304 × 1152 video will be created and uploaded. 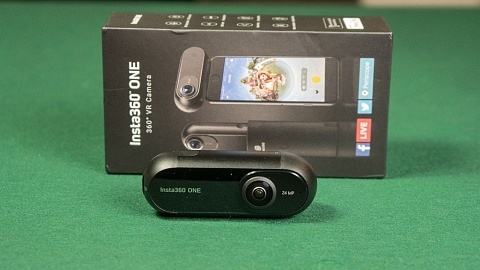 It is recognised by YouTube as 360° video. The second option is to export the video to your phone. Click on the locally saved clips. The „download“ option is now gone. Now you click “more” (three dots icon) and a new menu opens. Select „Export to phone“ and the video will be rendered and saved to your camera roll on your phone. In this step you can also add stabilisation (gyro calibration). The image doesn’t not necessarily need stabilisation within the camera. 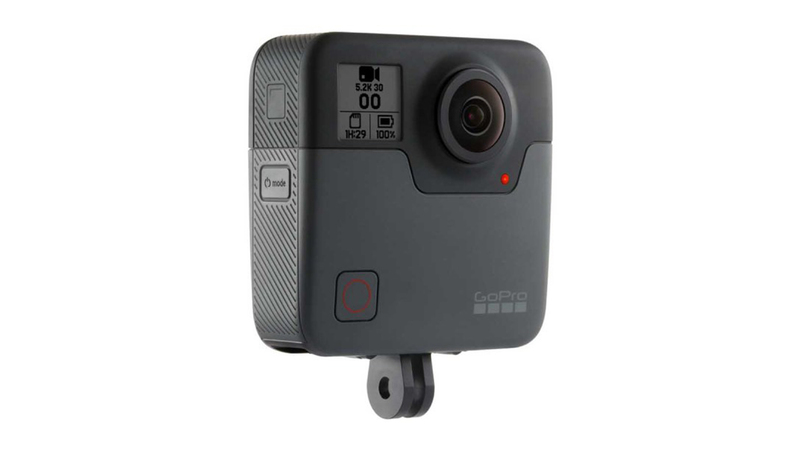 You already got a 360° footage, so all the image information you need. When switched on the app now maintains the initial forward framing, hence when you turn the camera the video won’t turn. Would be nice to have the option to select horizontal and/or vertical stabilisation. As far as I tested “Phone gyroscope” is not effecting the export, it just enables “looking around” within the video during playback. VR mode is also just for playback and gives you a dual screen to watch it with goggles, no effect on export. 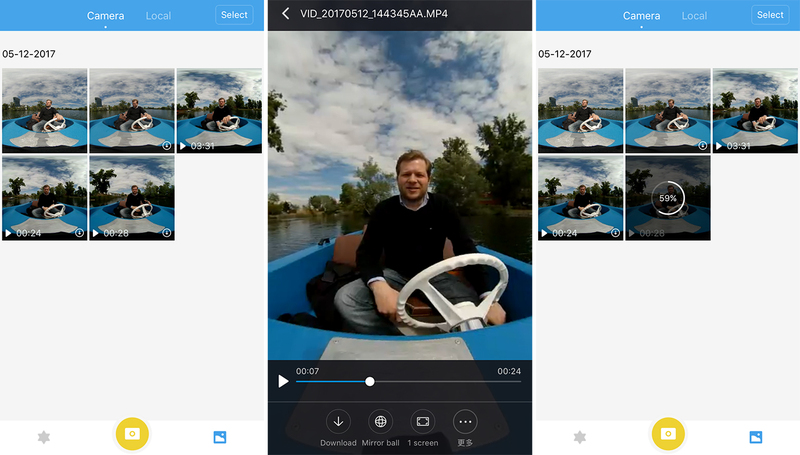 The video is now a 2:1 equirectangular clip stored on your phone. 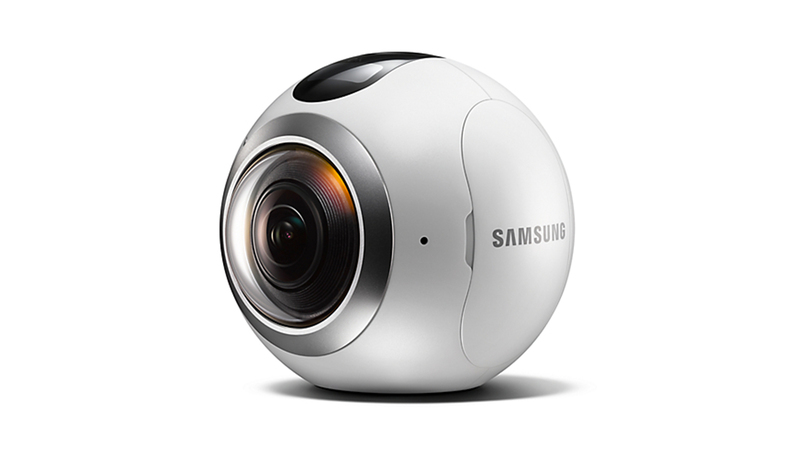 You can upload it to YouTube and it will be recognised as 360° video in 4K resolution. Or you can transfer it to your computer for additional editing. You can edit the clip which allows you to cut it, so you don’t have to render the full clip and you can add filters. With “record screen” record part of the 360° video which will be saved as a 16:9 – 1600 x 900 video clip. During the video you can even change the angle, but it’s hard to create a smooth pan. Screenshot will save a photo in your camera roll. Note: The screenshot is only of the angle you see, not a 360° image. Mirror ball lets you select different playback options, like little planet. These settings are just for playback due to my experience. Open up Mi PC Software where you can browse the library. Important! Do not rename the files. Only original file names are recognised. 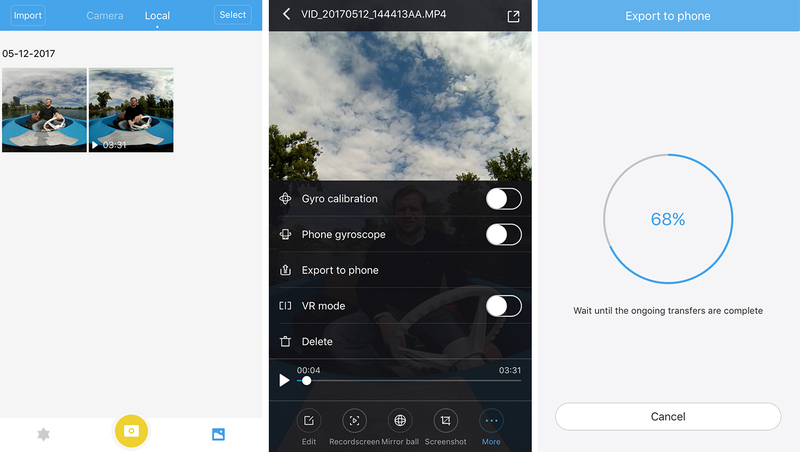 You may have noticed that Mijia 360 camera saves two files. One ending with AA, which is the main file, and one ending with AB which is a preview file. Only AA files show up in the results. You can also choose where the exported files should be saved. Basically you don’t have many options for export, in fact just one: Gyro on or off. See the little checkbox on the bottom of the first screenshot. After choosing on or off, click export next to it. When clicking “Export & transcode” you can see the files that are currently rendered and the completed ones. Biggest advantage of the PC software compared to the app is batch processing as you can select several clips which will be rendered one after another. I hope there will be some more settings in future (gyro fine-tune or only horizontal stabilisation, bitrate,…) and that there will be a Mac software, which was announced. Of course you can edit the video in any video editing software. Use the file created by your phone or PC software. It is in 2:1 format so be sure to use this format in your timeline! After you render your final clip (which has to be exported as .mp4! ), use the 360 Video Metadata Tool to add the 360 video information. Usually the 360 meta data is not stored in that exported video, you have to add it manually. Get the „360 Video Metadata Tool“ (available for Windows and Mac), which is also recommended by YouTube. Start the software, click „open“ and select the video file. Check „Spherical“ and click „Save as“ to create a new video file. This clip is now ready for YouTube upload. There was a glitch with earlier app versions, since iOS app 1.8.0 you can share your photos on Facebook without any problems directly via the app. Also when you export it to your camera roll or transfer it to your computer to edit it with e.g. Lightroom I noticed no issues anymore and Facebook recognises the image as 360° photo. Insta360 One Review – The Future of Action Cameras?